This recording is important as the only document of Durufle’s conception of his Requiem. He preferred the full orchestra version, which this is, and chose the mezzo soprano Helene Bouvier for the Pie Jesu. There are several iterations of this recording, the one pictured above and others. I would suggest looking for one on the Erato label since the Apex disc apparently has the digital anti-copying code and will not scan for uploading to your computer. Once you get used to the somewhat boxy audio quality, one notices that Durufle takes the tempi briskly, and has the choir sing with restraint. Mme. Bouvier performs the Pie Jesu with slight vibrato and with a sense of tragedy. Half way through the piece, the voice is placed high in the range and reaches an emotional peak. Bouvier handles this difficult section with aplomb and where other voices take on a certain tightness, hers remains supple and rich. 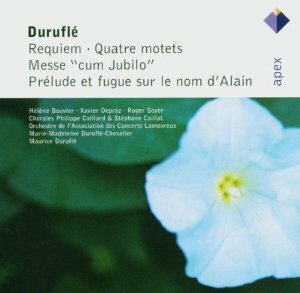 Durufle had an excellent understanding on how to blend the organ with an orchestra not only because of his gifts as an orchestrator but also because he had significant experience as an organ soloist prior to composing the Requiem. He premiered many French works such as the Poulenc Organ Concerto and was the organist of choice for conductors George Pretre and Charles Munch. With his wife, Marie-Madeliene Chevalier at the console, the organ in this recording meshes perfectly with the orchestral writing and is quite beautifully done. It is hard to argue for another full orchestra version since the only detraction of this one being the sub-par audio quality.